Castle Combe, otherwise known as the Prettiest Village in England, is nestled in the southernmost corner of the Cotswolds. Visiting this sleepy, rural community is like stepping back into the 14th century. Elegantly crafted stone houses, weavers’ cottages, stately gardens and narrow byways combine to create a traditional and picturesque English village. 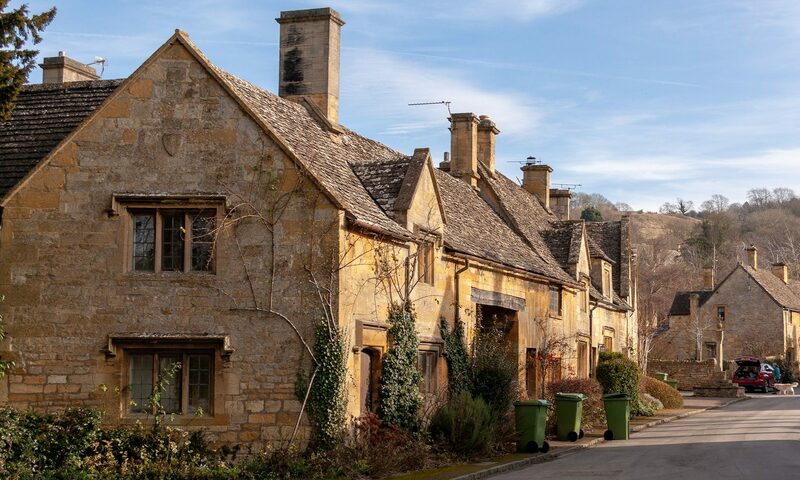 While the castle on the hill made famous by the Normans no longer exists, the village of Castle Combe is a beautifully preserved example of the way life used to be in the English countryside. If you are out on a walking tour of Wiltshire, be sure to stop here to have a pint and explore its ancient sites and quiet charm. Here are three must-see highlights. 1. A 14th century Market Cross can be found in the centre of the village. These stone landmarks were used to signify the market squares in medieval times. Adjacent to the Market Cross, you will also find a Buttercross. This stone structure is where traders and market goers would tether their horses. 2. Located in the centre of the village, St. Andrew’s Church was built in the 13th century. The tower was added in the 15th century. Wealthy wool merchants funded the tower. The tower’s clock, which was designed by a local blacksmith, is the most famous attraction at St. Andrew’s Church. The clock is not only faceless, which makes it unique, but it is also considered to be one of the oldest working medieval clocks in England. 3. Take a stroll from the Market Cross to By Brook. By Brook is the river that powered Castle Combe’s wool industry in the Middle Ages. The Town Bridge and the Roman Bridge both span this river, and they are charming, well-preserved relics of a bygone era. When you are looking for great holiday ideas for a getaway, check out Cirencester, in the Cotswolds, United Kingdom. Located Northwest of London, near Bristol, Cirencester is a very historic part of Britain and is a great place to learn about British history and architecture. Cirencester will provide you with a fantastic travel experience. Cirencester, the capital of the Cotswolds, has been around since the days of Alexander the Great and during the Roman Empire it was the largest city in England next to London. The city is filled with amazing architecture like St. John the Baptist Cathedral, built in 1490 and the Corinium Museum with many historical artifacts from the Roman Empire. 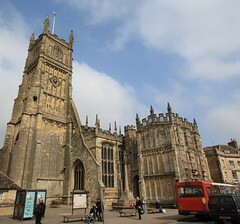 The photo above shows St. John the Baptist, Cirencester. Cirencester has a number of great attractions for you to enjoy including Cirencester Park with its lush geometric landscaping, the Cirencester Street Market and several walking tours that highlight the amazing landscape around the city. The Gloucestershire Way walking tour features a 100 mile walk through the Cotswold farmland. The walking tours are a great environment for taking photographs and just enjoying the fresh air. Other attractions in the area include the Broadway Tower that was built in 1799, the Abbey House Gardens, Batsford Arboretum, Mill Dene Garden, the Bristol Aero Collection, the Chedworth Roman Villas, Rodmarton Manor, the Brewery Arts Centre and the Cirencester Amphitheatre. The Corinium Museum features many great artifacts that go back to the prehistoric days as well as exhibits from the Roman Empire that range from tombstones and mosaics to sculptures, artwork and more. There are also relics and artifacts that have been unearthed by archaeologists around the area and examples of Victorian lifestyle during the 1800′s. The museum is open every day during various hours and an entrance fee is charged for admission. 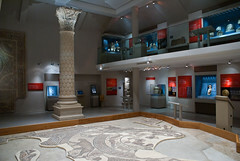 The photo above shows a view of the Corinium Museum, Cirencester. The Bristol Aero Museum in Cirencester features a number of aircraft exhibits from the Bristol Aeroplane Company as well as displays of British Aircraft, missiles and aircraft engines. The Bristol Aero Museum also features several events throughout the year that display the company’s business practices and industry projects. Cirencester also features many activities such as ballooning, cycling, horse riding, golf, fishing and more. There are also a number of artistic classes like pottery, wood turning and furniture restoration classes that you can take to learn various crafts. County Cotswold is known for its great shops and arts and crafts heritage, where you can find British antiques and many art galleries that showcase the artists around Cirencester and County Cotswold. The city of Cirencester also includes many Cotswold villas that provide very comfortable lodging during your stay in Cirencester. There are also several cottages, hotels and bed and breakfasts in the area for you to stay. If you enjoy camping, there are some campgrounds nearby that offer spaces for tents as well as caravans. There are also several car rental agencies in the area that can provide you with a vehicle to get you around the area. When you are ready for a great experience in the English countryside, check out Cirencester for your next holiday getaway. The Wye Valley is home to one of the finest woodlands in Britain, some of the most atmospheric ruins, and several rare wildlife species. It has been popular with visitors from Victorian times but it’s rarely crowded, and the position on the southern border between Wales and England makes it very easy to get to by car or by train. The area is best known for gentle walking along the banks of the Wye and in the wooded hills on either side. Several long distance footpaths wind through it- Offa’s Dyke Path is probably the most famous but the Wye Valley walk is just as spectacular. It runs from Chepstow all the way up to the river’s source in the hills of Mid Wales, 136 miles away. Day walkers will find plenty to see too, from the high crags of Symonds Yat Rock to Tintern Abbey. There are castles, caves, traditional pubs, and panoramic hillside views. Tintern is a typical Wye Valley town. It’s perfectly picturesque, from the restored water wheel to the village cricket green to the Old Station- once a stop on the Victorian rail line, the Old Station has been transformed into a museum and picnic spot. It was recently voted Britain’s favourite park. The Abbey lies right beside the river on the edge of town. The ornate arches of the Cistercian monastery really make this ruin stand out from the crowd and it’s hard not to be impressed by their huge scale alone. If you’re looking for something a little more thrilling than a walk or a picnic, canoe and kayak hire is available at Symonds Yat or Ross-on-Wye. Rock climbers come to the Wye Valley from across the UK but complete beginners are welcome at the local adventure schools. There are a wide variety of ways to enjoy this part of the world. Even a casual wanderer will almost certainly see some kind of wildlife, even if it’s only the swans on the river. Lucky ones might also see kingfishers or catch a glimpse of a shy otter. Those that venture into the woods might spot roe, fallow, or red deer, peregrine falcons, and even wild boar and polecats.